I am a recipe hoarder. There. I said it! I love recipes from cookbooks, recipes from the local food section (what’s left of it anyway), recipes from magazines, recipes from food tv cooking shows and recipes from the internet. I can’t seem to get enough. I print them, cut them, file and store them. Once in a while, I actually try them. My family loves new recipe days. A delicious home cooked meal waiting for them to return from their daily activities. Something different. Something creative. I love these days too. The problem is they seem to come fewer and far between lately. The heat of summer just hasn’t made me want to cook ANYTHING! The insanity of our weekly schedule has hardly afforded me the energy to sit down and plan anything unique. I think often about the movie Julie & Julia. The film where Amy Adams, who plays Julie, starts on an adventure to cook through the entire collection of Julia Child’s first cookbook. She subsequently blogs about her daily adventure. I would love to try something aspiring like that. The only problem is I just can’t see myself cooking rabbit, offal and other questionable meats. I mean eeeeew! Maybe one day, I’ll cook myself through my thousands of recipes. Motivation to try a new recipe, however, arrived last week thanks to The Pioneer Woman, Ree Drummond. I love her recipes. They usually involve way too many steps and pots and pans. 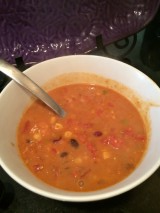 But she posted this soup recipe that intrigued me. Ten Can Soup. That’s it. Ten Cans. Oh…and some Velveeta Cheese Product. By personal choice, I usually don’t open a lot of cans and I avoid anything that includes a word indicating it is processed. But what the heck, I thought I’d give it a try. And I am so glad I did. My family loved it. Ad I literally put it all together in less than 15 minutes TOTAL! Here is the recipe. Drop me a line and let me know what your family thinks. Without draining the cans, dump them in a pot over high heat. 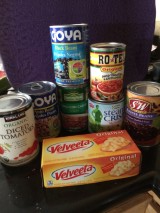 The chili, kidney beans, pinto beans, black beans, diced tomatoes, corn and the Rotel. Bring to a boil. Reduce the heat and simmer for 10-15 minutes. Add salt and pepper as needed. Dice the cheese and stir it in.